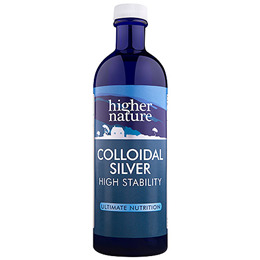 Higher Nature Colloidal Silver contains pure, medical grade silver, which has been used for many centuries. It is produced using electro-controlled technology and pure water from a 9-stage water purification process, to achieve a very small particle size (0.0006 to 0.005 microns). This small particle size is important because it provides a much greater surface area and therefore more of an effective liquid. Receive a FREE funnel for refilling the smaller size bottles when buying this product. 200ml Spray Refill for the 100ml and 15ml travel size. Contents: purified water and 99.999% pure silver, at a concentration of 10 parts per million. Particle size: 0.0006 to 0.005 microns. Use this 200ml bottle to refill 100ml and 15ml size bottles. Receive a FREE funnel for refilling the smaller size bottles when buying this product. Can be used on any surface as a hygienic disinfectant. Can also be used to disinfect utensils used for food and drink preparation and consumption. Can also be used to sanitise drinking water. Can be sprayed into the air. 36 sprays are roughly equivalent to 1 teaspoon. Disinfection of utensils used for food and drink, and surfaces. Below are reviews of Colloidal Silver - High Stability - 200ml by bodykind customers. If you have tried this product we'd love to hear what you think so please leave a review. Higher Nature Colloidal Silver contains pure, medical grade silver, which has been used for many centuries. It is produced using electro-controlled technology and pure water from a 9-stage water purification process.